Fall Creek; 9″ x 12″, ink and watercolor on rice paper, custom frame made of reclaimed barn wood (Eastern Pine), 2010. 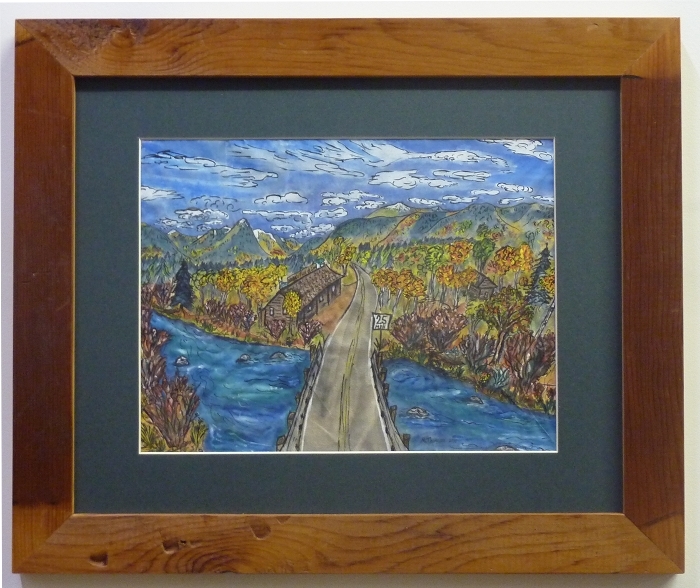 This is a custom piece a customer ordered as a gift for her father– it is an imaged scene based on a place in Wyoming he has a strong attachment to- the view of Fall Creek running through Wilson, Wyoming with Nora’s Fish Creek Inn nearby. 9″ x 12″, ink and watercolor on rice paper, custom frame made of reclaimed barn wood (Eastern Pine).